This page displays a collection of online videos about mining and extraction with a focus on how mining practices can be much less damaging to the natural environment. Video topics include mine planning and development, socially responsible and green mineral exploration and extraction, mining management and operations, site closure and reclamation, tailings and mine waste containment, and clean up of abandoned mines. Our society uses many raw materials that are extracted from the earth, such as iron, coal, uranium, diamonds, and gold. Mining often has a significant impact on the surrounding living natural environment and can adversely impact human health as well. Measures can be taken to mitigate these impacts and also to protect mine workers. Once mines are closed, it is vital to both monitor the sites and restore the surrounding lands and waters. Mining For Smartphones: The Tin Mines of Bangka Island – Part 1. A three part documentary series produced by Friends of the Earth showing the environmental and social impacts of tin mining on Bangka Island. Friends of the Earth calls on major international mobile phone manufacturers to take responsibility for the local and wider environmental and social impacts of the materials used in their products. About 13 minutes. Play Video – Part 1, Part 2, Part 3. 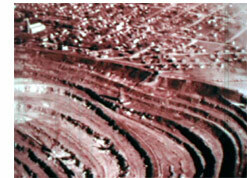 Mountaintop Removal: An American Tragedy. Narrated by Susan Sarandon, this video shows mountaintop removal coal mining and its impacts on Appalachian mountains, drinking water and families. Mountaintop removal is a mining practice where explosives are used to blast the tops off mountains to expose the thin seams of coal beneath. Once blasted, earth and coal dust from the mountaintop are dumped into neighboring valleys and waterways. This Mine Is Yours - Part 1. This mini-documentary shows how a medium-scale mining operation in Mindanao, Philippines can make sustainable development work for indigenous people despite the regulatory, social, and cultural challenges present in its business environment. About 24 minutes. Play Video - Part 1, 2, 3.